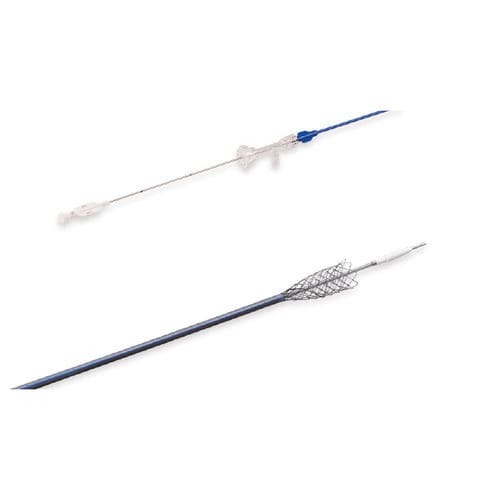 The Jaguar peripheral self-expanding nitinol stent with a delivery system is recommended for percutaneous intravascular deployment in patients with atherosclerotic, radiation and trauma-induced stenoses. It is a product of the engineers and physicians and encompasses all newest materials, technologies and trends in design of vascular stents. The Jaguar is valued by specialists in vascular interventions because it allows the broad spectrum of angioplastic approaches including the “cross-over” technique. Unlike most of the currently available stents the position of Jaguar self-expanding stent not only can be modified during the intravascular deployment, but also it can be safely withdrawn and repositioned during the same medical procedure. The soft and rounded tip of delivery system is atraumatic towards the arterial wall.